This curried chicken recipe uses raisins, mushrooms and peppers, giving it tons of flavor, without added salt. It can be pulled together in about 15 minutes so it's a great dinner for a busy evening! 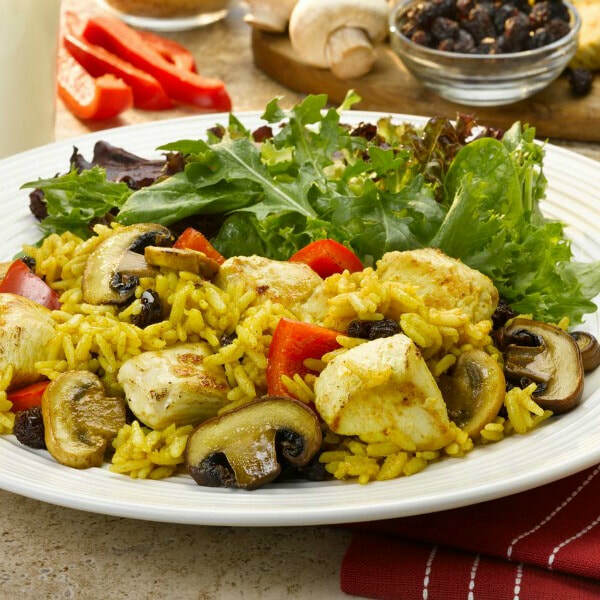 Try this Curried Chicken and Rice recipe for a different variation. Heat olive oil in large sauté pan. Add chicken and cook chicken for about 5 minutes. Add mushrooms and peppers and cook for 3-4 minutes. Gently mix in raisins, rice, and curry powder. Bring to boil, reduce heat and cover. Simmer until rice is done, about 3-5 minutes. Fluff with fork and let sit for 3-5 minutes before serving.